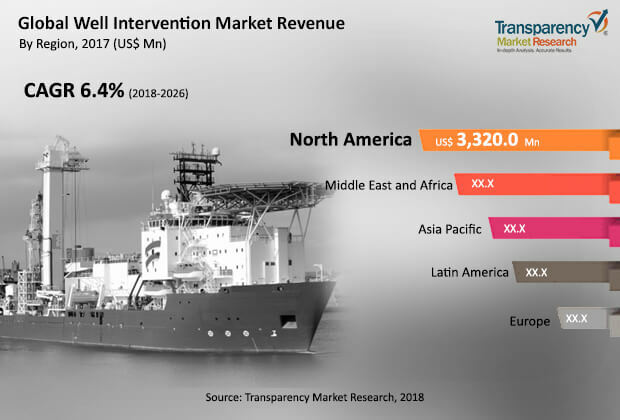 The global well intervention market was valued at nearly US$ 6 Bn in 2017 and is anticipated to expand at a CAGR of more than 6% from 2018 to 2026, according to a new report titled ‘Well Intervention Market - Global Industry Analysis, Size, Share, Growth, Trends, and Forecast, 2017 –2026’ by Transparency Market Research (TMR) . Rapid depletion of oil reserves is influencing the outlook of the global oil and gas industry. Hence, efforts are being undertaken to explore new oilfield reserves, particularly in North Sea, South China Sea, Gulf of Mexico, and the Persian Gulf, in order to cater to this ever increasing demand. This, in turn, is anticipated to offer substantial expansion opportunities to the well intervention market in the near future. Excess depletion of onshore oil and gas assets has shifted the investments from onshore to offshore oil and gas assets. Rise in demand for energy and increasing expenditure in the shallow, deep, and ultra-deep water oil & gas assets are expected to propel demand for well intervention services. Several key players in the oil and gas industry are investing heavily in offshore assets. Thus, a move from onshore to deep-water offshore drilling is expected to gain momentum, led by major international oil and exploration & production companies that stand to uncover large discoveries and are willing to pour substantial dollars into exploration efforts. More than 70% of new discoveries have been found in offshore areas. Declining prices of crude oil could have an adverse effect on well intervention services across the globe. Governments of several nations have imposed strict norms and guidelines related to carbon emissions, which has led to a shift in investments into the renewable energy sector. Governments of several countries are providing subsidies related to generation of renewable-based power, boosting the renewable energy sector. Coiled tubing services consist of reliable and efficient well intervention for vertical, horizontal, highly deviated, and live wells. Coiled tubing is designed to improve well and reservoir performance. Its applications include wellbore cleanout, matrix and fracture stimulation, logging, nitrogen kickoff, perforation, sand control, drilling, well circulation, mechanical isolation, and cementing. Coiled tubing and slickline are widely used during well intervention. Coiled tubing is an important type of service, as it can be used for vertical, horizontal, highly deviated, and live wells. In terms of type, the light well segment dominated the global well intervention market with more than 50% share in 2017. It was closely followed by the medium wells segment. More than 6,000 subsea wells existed across the globe in 2016. Increase in oil recovery from the wells is augmenting the subsea light well intervention services. These services include repair, installation, and manipulation of mechanical devices (plugs, valves, screens, etc. ), scale removal, perforations and re-perforations, fluid sampling, zone isolation, well abandonment, and chemical treatment. Light well intervention technology lowers the intervention cost by about one-third i.e., intervention cost is about 50% to 60% less than that of the drilling rig. This enables more intervention work, which results in better exploration of subsea wells. Light well intervention is a cost-effective alternative for well intervention and repair of subsea wells compared to drilling rigs. North America dominated the global well intervention market in 2017 and the trend is expected to continue over the forecast period. The U.S. has drilled more than 14,000 wells in 2016 and is expected to explore more oil and gas wells in the near future. The U.S. upstream market is a complex combination of technical, financial, political, and logistical factors. Increase in exploitation of unconventional reserves is likely to boost demand for well intervention in the near future. Among unconventional plays, the Permian basin will certainly lead to U.S. supply growth. The global well intervention market is a highly competitive. Leading players dominate the market. It is highly fragmented with a large number of local and international players competing in the market. Leading players dominate the market. Key players operating in the well intervention market are Schlumberger Limited, HELIX ESG, GE, Halliburton, Oceaneering International, Inc., Expro Group, Hunting Energy Services, National Oilwell Varco, Deepwell AS, and Weatherford International Plc.